Following the advent of megaships, the performance requirements of container terminals have increased significantly, highlighting necessary changes in their layout, infrastructure, and equipment. We focus on the impact of megaships on a terminal within the port network of the Italian Region of Liguria, in terms of its ability to manage the flow of imports from arrival to inland destinations. We use discrete event simulation techniques to analyze the operations of a terminal and evaluate the relevant performance indices in different scenarios, which vary as a function of the “call size” of the larger containerships. The possibility of guaranteeing a more balanced modal split (favoring rail transport) for the inland distribution of containers is also evaluated. Dwell times at the yard and turnaround times at the berth are considered, with the objective of achieving a modal split of inland transport consisting of no less than 40% rail. Our results show that this objective can be achieved if a higher dwell time for outgoing containers is allowed. 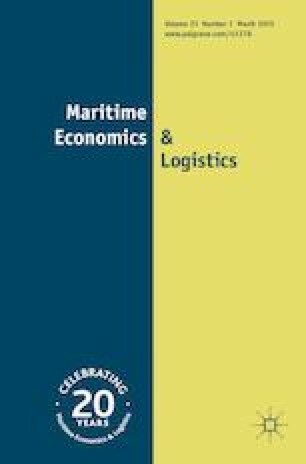 This work has been partially supported by the PRIN 2015 Project: “Smart PORt Terminals – SPORT: Gate Operations and inland forwarding,” funded by the Italian Ministry of Education, University and Research. We are most grateful to the MEL reviewers for their exceptionally detailed and in-depth work, and for their useful comments which allowed significant improvement in the quality of this paper.